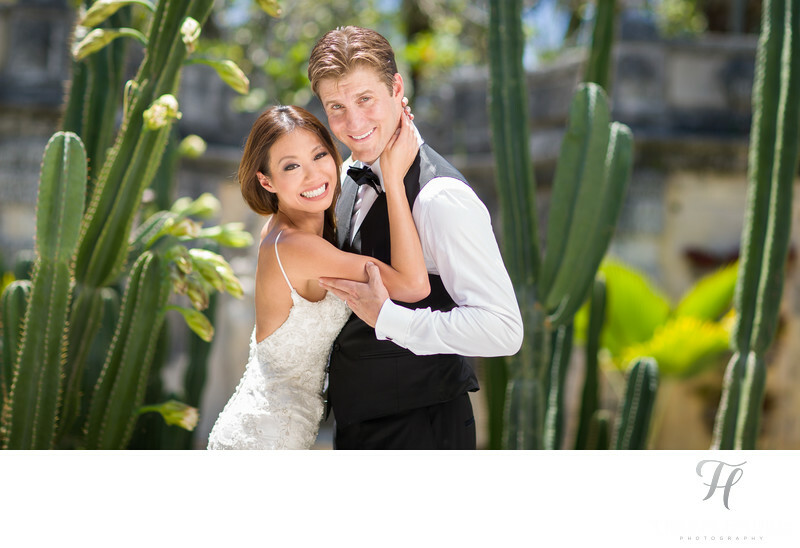 This wedding photo in Vizcaya is unique because it was taken in about 100F heat, and it was not even on the wedding day. Annie and Ryan hired another wedding photographer to shoot their wedding (I know right.. too bad for them)... and, as it turned out they were not happy with the results that this other photographer gave them. So, they did some more searching and found my site, and hired me to go out and take some "real" pictures of them. I was so happy, because this is right up my "ally". In fact, I try and advocate to all of my brides just how important it is to have enough time on the wedding day to support amazing shots like this. More and more I have seen some brides actually plan on doing an "after shoot" just so they don't have to deal with the stress of trying to do everything on the wedding day. I think this makes a lot of sense, and I hope to see more and more brides adopt this mindset. Yes, the wedding day is special and of course we will get stunning content on that day... however, no matter how you cut it, you will always get better content if you eliminate the wedding day timeline and do styled shots on a separate day. You can see more from this session over on my blog. Location: 3251 S Miami Ave, Miami, FL 33129.